A good Sunday walk; not too strenuous with pleasant towpath scenery. The main objective was to visit Maplin in Reading for a few essential boat components. The visit was successful as I managed to purchase the four necessary items. On my return to Waiouru I found Nick working on the installation of the Hurricane heater. It’s now almost completed. We have run some data cable from the Hurricane control box to the middle of the saloon. This will connect the combination thermostat/timer to the rest of the system. Cutting the hole in the panelling above the gunwale was the easy part. The difficult bit was getting the data wire up through the base of the gunwale and foam insulation! The way we have the Hurricane configured is two separately controlled circuits. One has the Hurricane heating the water in the calorifier and the other the central heating system. 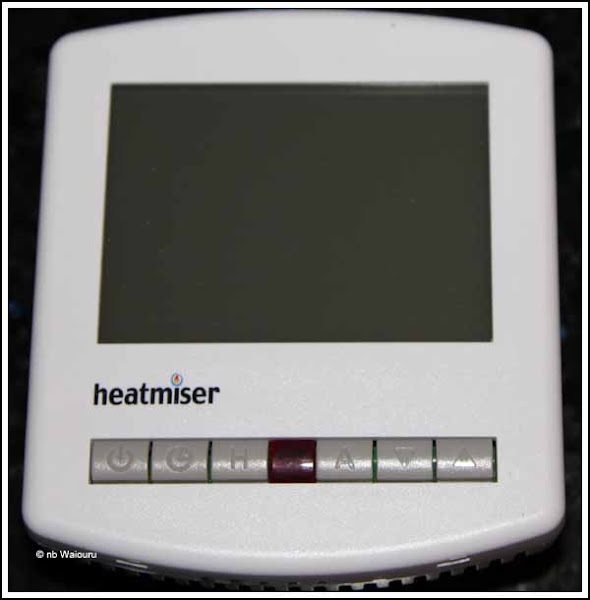 There is a separate thermostat for each circuit and both can be separately controlled via the timer and the thermostat. All this is very standard for the Hurricane. Where we are going to be slightly different is with the setup for the remote control. I want to control the Hurricane using the Empirbus system. To do this I purchased a 12v relay from Maplin. The primary side of the relay will be controlled by the Empirbus system and the secondary side will be connected across the back of the remote control. Reverse side of the Hurricane remote control with the arrow pointing at the terminals for the ON/OFF switch. The plan is to solder two wires onto the switch terminals and run them to the 12v relay. When the 12v relay is activated by the Empirbus system the terminals will be bridged thereby turning on the Hurricane. 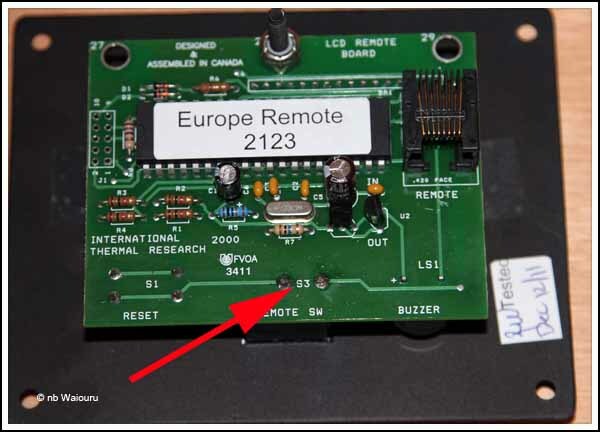 The switch on the front of the remote will always be OFF as the actual activation will be done using the relay. The LCD display will continue to work when the relay is on. Using the Empirbus system to control the relay means we can have multiple switches. Initially we will have three. One beside our bed; one in the saloon, and the system master isolation switch on the instrument panel. Having the Empirbus system control the Hurricane means we can also use the TEXT function to control the Hurricane. So we can turn the Hurricane ON (or OFF) remotely via a TEXT message to Waiouru. The other components purchased at Maplin were a 240v relay, base and box. 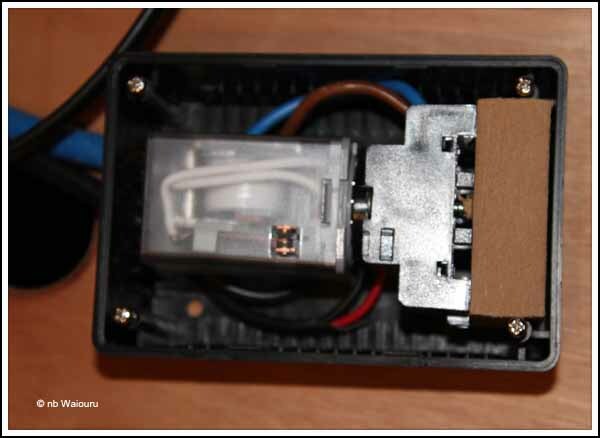 The relay will control the cooling fans by activating them when the inverter is producing 240v AC. The location of my “little black box” has been discussed with Nick and he has decided it should be fitted in the inverter cabinet on the far wall beside the extraction fan. 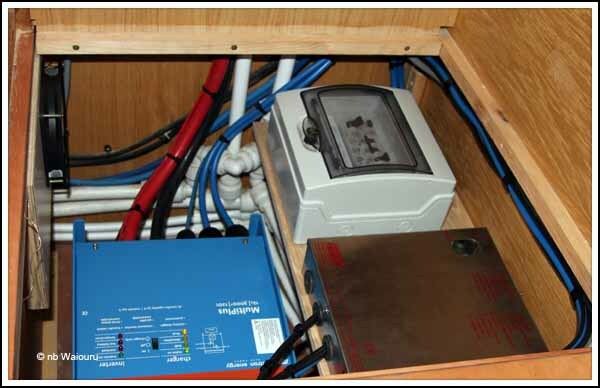 You may have noticed Nick has finished installing the Consumer Unit (top right) so all the 240v circuits in Waiouru is now connected via the shore-power plug. I hope to get the second cooling fan and the relay installed tomorrow. Late this afternoon we had a telephone call from Anne Boland who was in the area and though she might visit. Last year Anne very kindly allowed us use of her student house in Plymouth for several months whilst we were attempting to resolve our dispute with the first boat builder. We have stayed in contact ever since. It was lovely to catch up with her and hear about her involvement as a London Olympic volunteer.